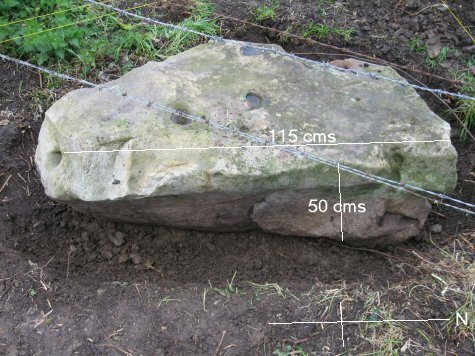 A monolithic stone was discovered at Bear Mead, 30 metres South of the River Stour, at the boundary of two fields in Bear Mead. 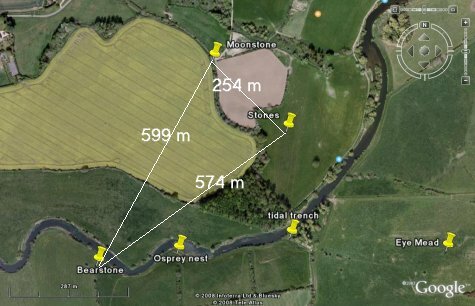 Located at SY 986-993, it is normally covered by summer vegetation, but was known by the two neighbouring landowners. 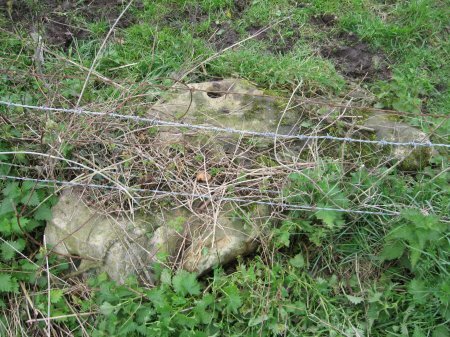 It appears to have toppled towards the South, trapping some old (c1815) "Inclosure Act" fencing wire under and around it. 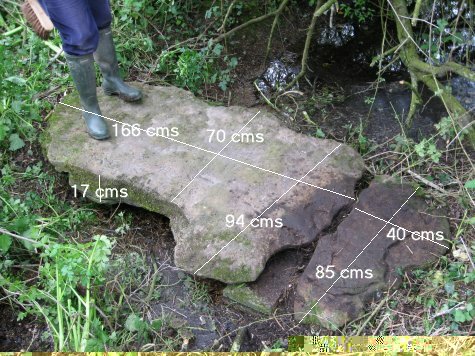 Approximate dimensions are 1.5 m high x 1.1 m wide (base) and 0.4 m wide (apex) x 0.44 m depth, volume about 0.41 cubic metres. 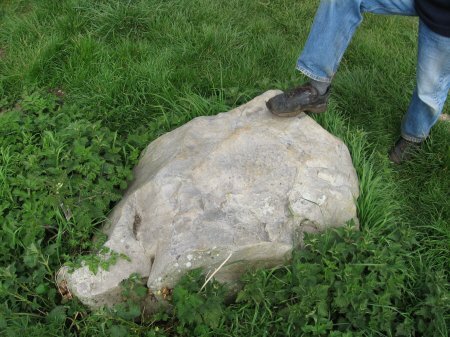 The stone seems to be fine limestone, nearest source Purbeck (23 kms to the South and on Dorset's Jurassic coast). 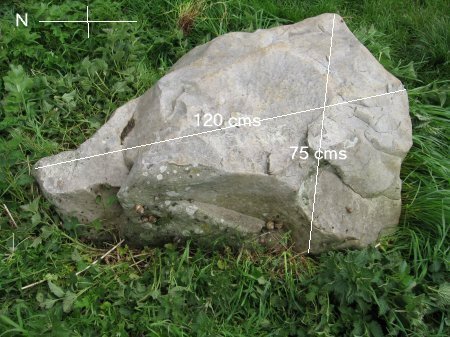 Such limestone has a density of 2,650 kg/cubic metres, suggesting an approximate weight for the monolith of 1,076 kg. 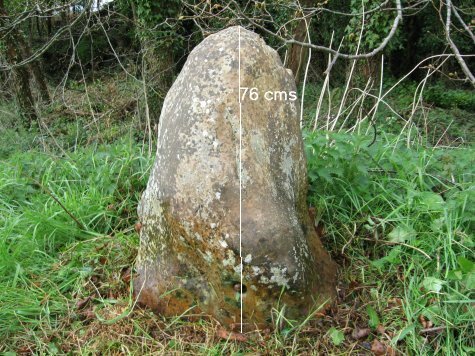 For convenience, the author refers to this monolith as the Bearstone, after its location in Bear Mead on the South bank of the Stour 2 kms West of Wimborne in Dorset..
A similar toppled monolith is known at SY 988-998, about 600 metres to the NNE, on the other side of the Stour in the Cowgrove area. 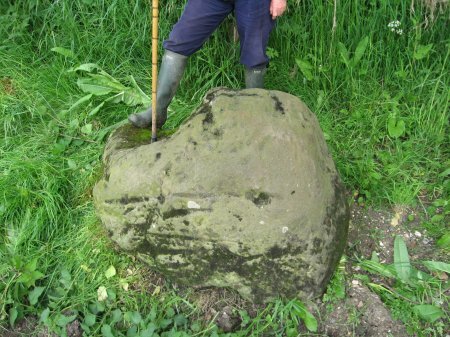 Called the "Moonstone", it appears to consist of similar fine limestone to the "Bearstone". 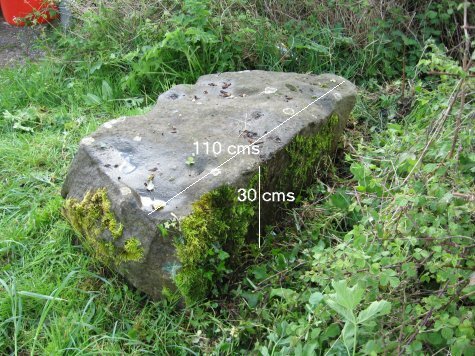 Approximate dimensions are 1.2 m high x .75 m wide (base) and 0.2 m wide (apex) x 0.4 m depth, volume about 0.18 cubic metres, suggesting a weight for the Moonstone of 477 kg (44% of the Bearstone). 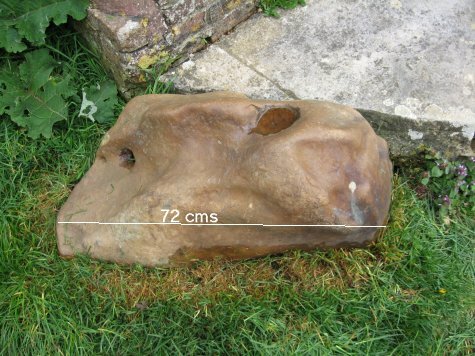 If the source of the stone is indeed Purbeck, both monoliths could have been transported by water, by sea from Purbeck to Christchurch harbour, then up the Stour to less than 200 metres from their present locations. The shapes of the Bearstone and the Moonstone are very similar. 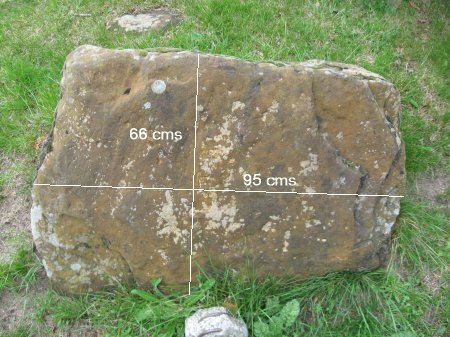 An OS map, (2nd edition, dated 1902, surveyed 1885, 6" maps XXXIV NE and XXXIV SE) shows 5 "stones" in a rough circle, centred on SY-992-996. 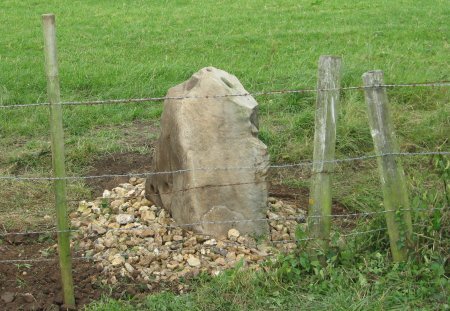 The Bearstone lies 570 metres to the South West of this circle, and just possibly may have acted as the "hele" stone. The Moonstone may also have been associated with this circle. 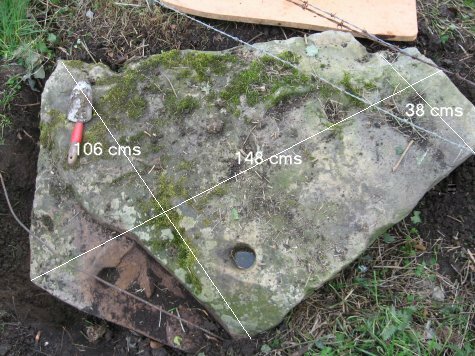 None of the 5 encircled stones were visible above the surface in 2008. 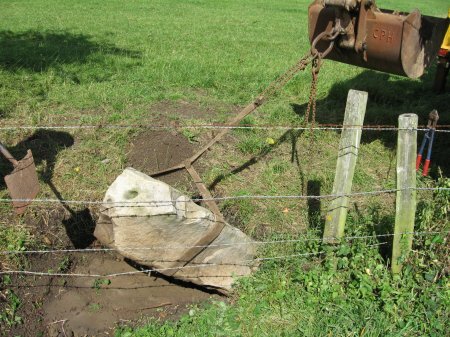 It is likely that many of these stones are boundary stones used before the Inclosure Act in 1805 to mark the meeting points of unfenced fields. 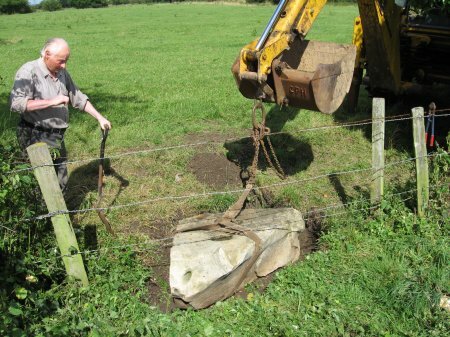 The Bearstone was finally raised on 7 Aug 2008, with the help of Gerry Watkins (digger) and Farmer Martin. It slipped into its socket pit without a problem, and was quickly packed round with earth and flints. Nothing was found underneath except clay. A time capsule has been left in a natural hollow in its base. It needs a bit of cleaning. MN-circ. Circle of Stones shown in OS 1902 map. MN785. The "Bearstone" before excavation, almost covered by early Spring vegetation. MN795. "Bearstone" upper face. North on left. MN812. "Bearstone" East face, excavation complete. MN0966. 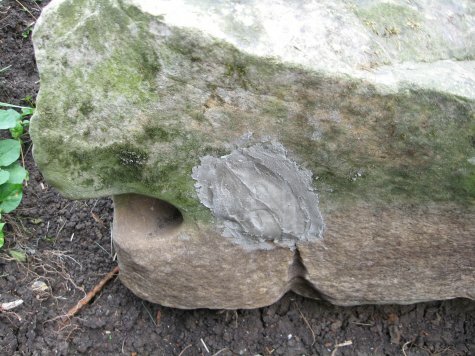 "Bearstone" - time capsule cemented into natural hole in base. MN1097. "Bearstone" ready to raise into the vertical. MN1098. "Bearstone" being raised with digger. MN863. 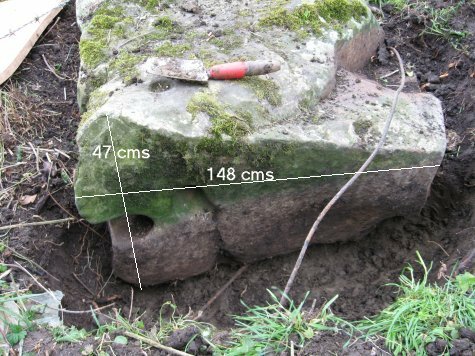 ¼ inch diameter, single strand 'wire', found trapped under toppled Bearstone. MN989, MN990. 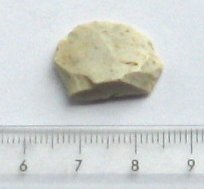 A "thumbnail scraper", a form of neolithic flint tool, was found under the monolith while digging the pit. 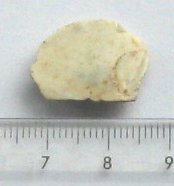 It shows a flint flake struck off a larger flint, producing a very sharp edge (which was later serrated) and a "wavy" pressure face. It fits nicely between thumb and forefinger, and was used to cut across sinews or wood. MN792. The "Moonstone" 600 metres to the NNE. MN817. 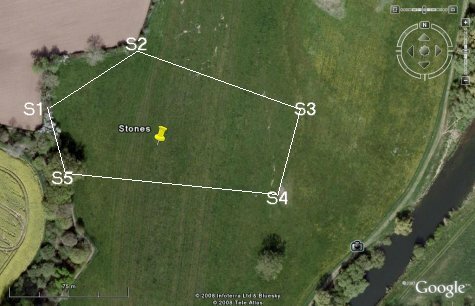 Stone D at Poplar Farm ST 985-000, bridging the pond feeder. 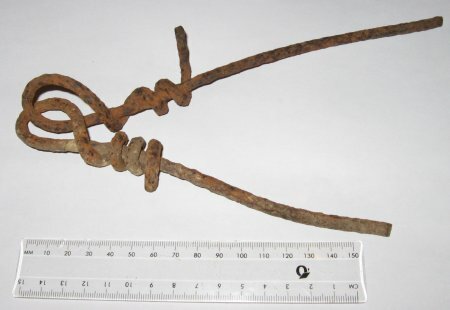 "...found by John Soffe when he was clearing some of the land for Harry J Palmer before Fairfield estate was built. He put it on show as the Broad Stone for a joke..."